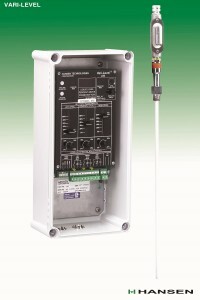 This popular, user-friendly, and field-proven system consists of a control unit, and a probe to be inserted in a level column. Control unit models are available with up to five individual level set point relays. Level set points and differentials can be easily set up, and then simply changed by moving knobs when necessary. A built-in level simulator enables the operator to easily check proper operation of control valves, pumps, and alarms at the various set points. For use with ammonia, R22, R134a and other compatible refrigerants.